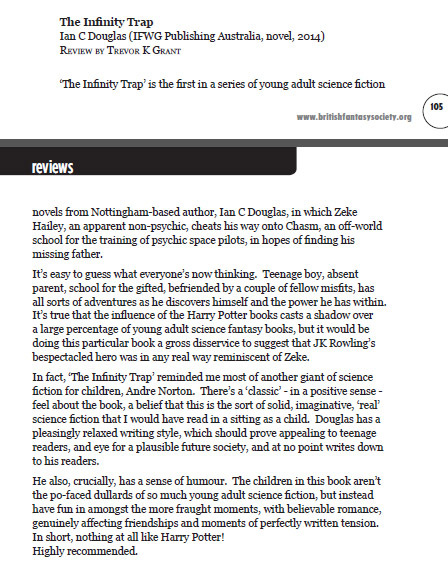 In fact, ‘The Infinity Trap’ reminded me most of another giant of science fiction for children, Andre Norton. There’s a classic-in a positive sense-feel about the book, a belief that this is the solid, imaginative, ‘real’, science fiction I would have read in one sitting as a child. To read the British Fantasy Society’s review click here. Taken from author and bloggist Lee Murray’s blog site. Taken from the Amazon reviews here. Ian Douglas’s science fiction adventure sees its hero, the blue haired Zeke Hailey, con his way into a school for psychics on Mars in the 23rd century. His father has disappeared in mysterious circumstances, and Zeke is on the trail, willing to fib his way through the entrance exams of the school to get some answers. On the way he falls foul of a nefarious academic searching for a terrible weapon on the Red Planet, butts heads with the de rigueur set of school bullies, and finds he is the only hope of rescuing a kidnapped classmate. It all crashes along at a fair old clip, and youngsters will find much to enjoy in this zippy adventure. This book was a real delight. Why? Chiefly it had great pace and the story naturally unfolded with the ease of Mars’ red sand through your fingertips. The writer peppered the book with science (which I can only assume is real or so cleverly made up) but not once does it slow down its break-neck speed. The writer has a really good vision of life on mars as well as all his characters. Zeke is likable, curious enough to get into trouble, but not a “bad boy”. At one stage, it did feel like it slipped into Harry Potter territory while the school and teachers were being introduced, but luckily (for me anyway) it stopped short using the familiar territory to help set the scene, but then went off in its own direction. While aimed at children and YA, the mystery is very engaging and the twists and turns work well to throw you off the scent. The story is self-contained​, but there’s enough hints and loose ends ready to drag you into the next book. I’m really enjoying Zeke Hailey’s adventures in Ian Charles Douglas Martian twist on Hogwarts. Fantastic landscapes and monsters, great cast of characters, a satisfying emotional arc and lashings of peril. Very much admiring how well it is pitched to its genre and audience. Hurry up and bring on volume three, Mr Douglas! We travel back to Mars and meet old friends and are treated to some new ones – teachers, pupils and residents of mars ( not to mention the rat on the cover). 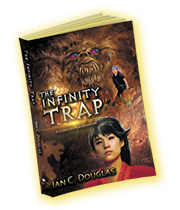 This book is a true sequel in that it follows on from the first a bit like a soap opera, so make sure you read The Infinity Trap first. We get to see a lot more of mars this time round and spend less time in school. Mr Douglas is clearly sowing seedsfor the future. Can’t wait for The Particle Beast. The Particle Beast continues in the same vein as the previous two, offering a fast paced and fun adventure complete with pan-dimensional nasties, a a short tempered Irish android, and teens charging around with psychic powers like well-meaning chimps with machine guns. While this one starts a little less steady as it picks up the threads of the previous two, it quickly comes together and finishes the strongest of the three. In addition to fleshing out and developing the characters a lot more, The Particle Beast reveals more of the dark underbelly of the Mariners’ Institute, setting things up for a great fourth book and hinting that our reigning champs will need to do a lot more than be good a splatting beasties from here on out. If you'd like to sign up for info on future Zeke Hailey books, please use the box below. Don't worry, you'll only get one-off announcements when the books are due. Thanks!